There’s pizza and then there’s pizza, and for some reason the topic of authentic Neapolitan pizza keeps coming to my attention. In May, I took a stab at creating a homemade version with the help of the A16 book, and that was great, but it was nothing like sitting back and letting the pros create the real thing in a wood burning oven. Last year, while in Phoenix, we were lucky enough to dine at Pizzeria Bianco whose pizza has been called the best in the US. All the praise this place has received is well-deserved. I would happily go again and wait outdoors in the Arizona warmth for the doors to open and scurry forth in hopes of getting one of the coveted tables next time we visit the area. Now, here in Austin, we have some excellent restaurants and some fine options for pizza, but I’m afraid there’s nothing quite like that. That’s why I was excited to learn of a particular pizzeria located just down the road in San Antonio. In the June issue of Food and Wine, there was an article about pizza artisans from different parts of the country. One of those was the restaurant Dough. 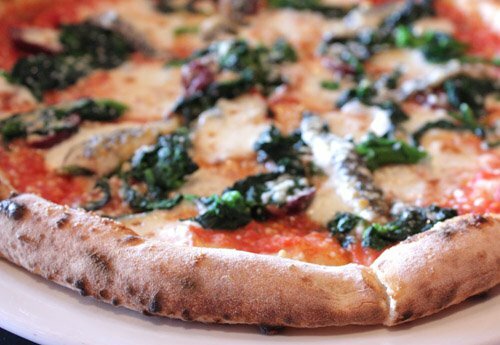 Not only do they make Neapolitan-style pizza, they are one of only 32 US restaurants with a certification from L’Associazione Vera Pizza Napoletana. I had to check it out to see what we had close to home. I wanted to find out how it compared to Pizzeria Bianco, and sample as much of the menu as possible. We don’t often find ourselves luxuriating over an Elizabeth David-esque three hour lunch, but if you can skip breakfast and work up a good appetite, it’s a lovely way to spend a Saturday. We chose a bottle of Fattoria Rodano Chianti Classico Riserva 2001 which was nicely dry and tasted of blackberries. It was a good, sturdy red but not one that dominated the palate. We quite enjoyed it with the starters and pizzas. One of the specials was an imported Puglian burrata di bufala served with heirloom tomatoes, balsamic, basil pesto, and roasted garlic. The bread that came alongside was crunchy-crusted, house-made sourdough. We also sampled the smoked salmon rollatini in fett’unta with red onion and capers sitting on locally grown arugula. Then, the flatbread with oregano, thyme, and sea salt which is made from the same dough as the pizza, came with the antipasto platter that was filled with warm olives, roasted summer vegetables, three types of cheeses, and three types of cured meats. At my next dinner party, there will be warm olives. Last was the arugula salad with green beans, sliced potatoes, and parmigiano reggiano. There was nothing to complain about among these starters. The imported burrata was heavenly. That was the most difficult item with which to show restraint. We knew a lot more food was coming and that we needed to pace ourselves, but that cheese made it very difficult. So did the flatbread. The warm olives on the antipasto platter were buttery and irresistible, and the vegetables were not the afterthought they sometimes are on such platters. These were freshly roasted, warm, and perfectly seasoned. The salad was dressed with lemon juice and truffle oil, the arugula was incredibly fresh, and I could have continued eating that all day. It was a little aggressively seasoned as was the arugula under the salmon rollatini, but not to an extent of disappointment. We moved on to the pizza. First was the pizza napoletana margherita with house-made fior di latte, heirloom tomatoes, parmigiano, and basil, and it was a beautiful thing. The ingredients were simple but perfect, and this was my favorite of the three we tried. Next was the pork love pizza with tomato sauce, fior di latte, salami, sausage, pancetta, and speck. Based on Kurt’s reaction, this was one fine pizza. He enjoys meat from time to time but isn’t a huge pork fanatic. This pizza may have changed all that as he raved about this more than any other thing we sampled. Last, we tried the puttanesca pizza with tomato sauce, fior di latte, rapini, garlic, olives, hot pepper flakes, anchovy, and extra virgin olive oil. This was a spicy, full-flavored pizza that wasn’t shy about the anchovy component. I like anchovies though, and the mixture of big flavors worked well. This was the opposite of the restrained margherita, but delicious in its boldness. The parade of desserts started with panna cotta made with house-made creme fraiche, cream, and vanilla bean. It was served with raisins and bing cherries that had been cooked in marsala. We learned the restaurant had experimented with other panna cotta recipes before settling on this one which came from an employee’s Sicilian mother. There was also a scoop of peach gelato made with Fredericksburg peaches and a polenta cake with strawberry puree, creme anglaise, and whipped cream. There was, again, nothing to fault here, but it was the panna cotta that stole the show. The texture was perfect, the flavor was lovely vanilla cream, and the fruit in marsala added a nice, sweet-sour accent. 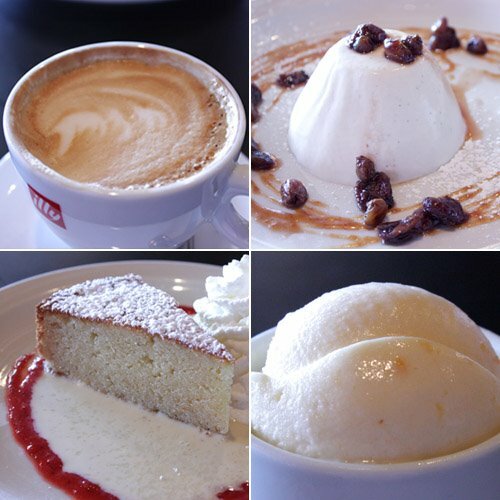 Our espresso and cappuccino with dessert were both well-made, and I can be picky about my cappuccino. The owners, Doug and Lori Horn, have created something exceptional here. They use local sources for the greens, basil, tomatoes, and as much of everything else as they can. They also have a mozzarella bar near the entrance where diners can watch as cheeses are made throughout the day. The restaurant sits in a quiet, little strip mall just off the expressway, but nothing about the outside matters once the food starts arriving at your table. In the end, I’m not sure I can do any useful comparing and contrasting with Pizzeria Bianco. Both serve Neapolitan pizza, and both are doing something special, but they do it in slightly different ways. Dough’s menu offered a few more options than Bianco’s. We visited Dough at an off, mid-afternoon time, so I can’t comment on the dinner-time rush, but I know the setting and very limited seating are a big part of the experience at Bianco. I can tell you that here in Austin, we don’t like driving more than about 20 minutes to get to a destination, but we left Dough feeling like the hour and twenty minutes getting there in the car was well worth it. We now know that we do have authentic, delicious, Neapolitan pizza in Texas, and we’ll be back for more. I want a mozzarella bar in my house! That looks like an amazing meal. Defo on our list of things to do. Oh lucky lucky you! Nothing like that around here! Beautiful pictures. Great to see you with a 24 post! Fun, huh? Looks like someone had a fantastic time chowing down. Each pizza looks amazing as does the gelato. I've been to several AVPN establishments around the country, and now feel inspired, at some point to try them all for - in the name of research to see if they're up to snuff. =) Your meal sounds like a true delight and maybe the drive made you appreciate it even more. Your menu selections sound divine and I am now convinced that my pork loin will be Italian themed after all your commentary, it was a toss up with Mexican and Greek, but you tipped the scale. Thanks! fantastic 24, 24, 24. My husband's is ethnically italian and they set forth to the states from Naples and this is the only he thinks pizza should be. I love neopolitan pizzas. Cool 24 post. When you know the food is good, it's always worth the drive!! What a wonderful place! Everything looks so fresh and delicious. 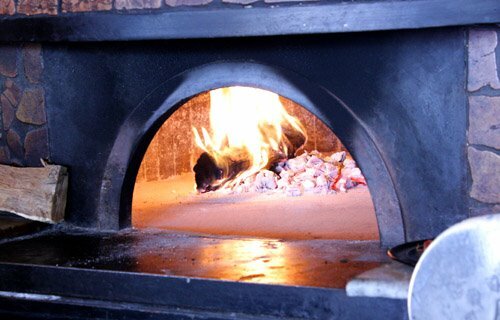 I am so envious that you've been to Pizzeria Bianco! Gosh, look at all of this food, they all very tempting looking! how lucky! The pizza looks amazing -- as do those desserts!! I could go for the desserts alone! Excellent assortment! What a fantastic pizza dinner! I am constantly amazed at how much better the restaurant quality is getting. WOW..that is a lunch to die for! 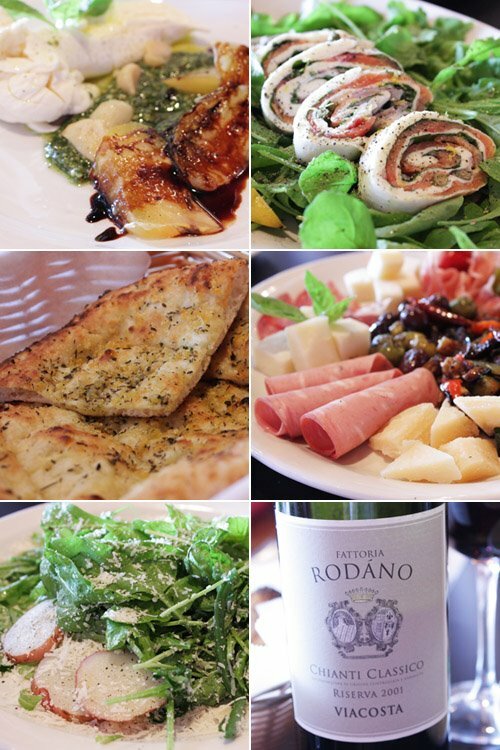 I especially love the pizza, and mozzarella bar! I keep wanting to take part in 24, but I never have enough people to feed..LOL Awesome job and gorgeous photography! i've started completely ignoring appetizers because i have a tendency to go hog-wild and fill up on them, sadly leaving little to no room for my favorite part--dessert. speaking of dessert, golly, those look great. everything looks great. Whoa, what a feast! I'm jealous. The photographs are very beautiful, Lisa. Great job! Now, for a moment there I did a double take. i thought you were going to tell us you'd installed a wood oven in the backyard... I'm rather jealous, All the food sounds fantastic but I'm fixated on the burrata. You had burrata??? How wonderfully decadent. Wow, that sounds like a lunch I would love to participate in. A mozzarella bar? Um, wow! "Puglian burrata di bufala served with heirloom tomatoes, balsamic, basil pesto, and roasted garlic." I'm really curious about the Puttanesca Pizza..I bet it taste great..
Love your 24, 24, 24. The pizza look awesome. I have an award for you on my blog. We don't eat much pizza, but this pizza seriously looks excellent. Next time we go to San Antonio, we'll have to go there! Thanks for sharing! Excellent 24,24,24 post! The pizzas look absolutely delicious! The burrata sounds really good - we just had some in Boston and really enjoyed it too! 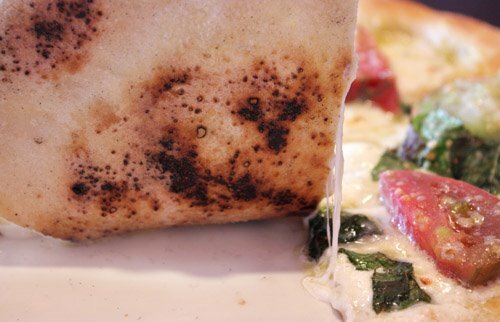 That pizza and panna cotta make me want to hop a plane to Texas. How great that you got chosen! That was an amazing place...I LOVE the looks of that crust of that pizzas! Teehee...I'm feeling smug right now. I read through all of the comments, hoping that at least one person here could say that they've experienced the real thing on more than one occasion, but I guess I'll have to step in here and make that claim! Sorry people! Being that I live in the land where it all began, I can totally relate to the italian theme - the burrata, the fior di latte, the puttanesca-what-have-you and everything else. La cucina italiana e' la piu' buona del mondo! Congrats on the Foodbuzz 24! Well, now I know where I'm going on my next visit to S.A. Thanks for the heads up! 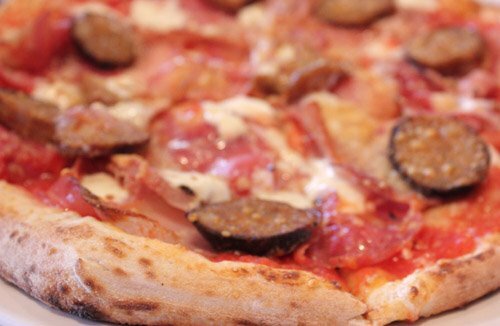 Have you ever tried Salvation Pizza in Austin? We found it to be a great pizza but still not as good as Cippolina's. Maybe someday I can have the real thing in Italy, but for now, I'm happy. I have never heard of AVPN! That is AMAZING. I must say that when I moved to Washington, DC, I was devestated by the lack of good pizza options. Growing up in NY, in one of the most Italian towns in the country, and then moving to Manhattan, I never had a short supply of fantastic pizza. Thankfully, I am moving back to NYC next week, and the first thing I am going to do is grab a slice! I'm glad you found a place that you know will always have great pizza! That looks all absolutely incredible. We do miss a good pizza place around here I have to say. I just refuse to eat all the cartonboard ones you can generally get around here, which means I hardly ever eat pizza, unless it's homemade! I have had burrata a couple of times and find it absolutely transporting. I am hoping I can find it here in Seattle for a special dinner I am making in a few weeks. What an amazing feast you guys had! Next time I am in Texas, I want to eat with you guys! Lisa, congrats on pulling off a fab 24 event with a long train of delicious food! These dinners are exhausting but loads of fun!